The Enneagram describes three centers of intelligence: our mental center, where we have our ideas, plans, and language; our emotional center, where we have our feelings and our empathy for other people; and the body center, where we have three major instinctual drives. These are called the self preservation, social, and one to one (or sexual) instincts. We use all three of these instincts for the activities of daily life. However, one of these instincts is more important to us and influences how we express our personality type. This primary instinct interacts with our Enneagram type to create a "subtype." 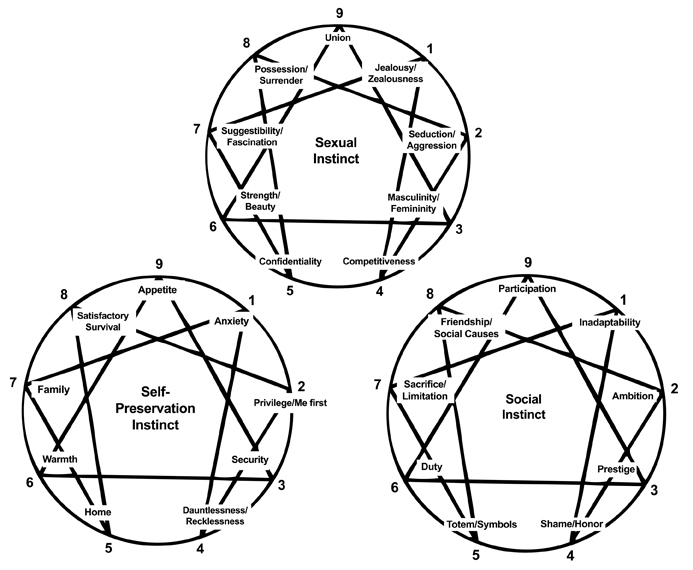 So for each of the nine Enneagram types, there are three important subtype variations. Our path in life is shaped by both personality type and subtype. The self preservation instinct governs our needs for material supplies and security, including food, shelter, warmth, and family relations. The one to one instinct governs our sexuality, our intimate relationships and close friendships, and the vitality of the life force within our bodies. The social instinct governs our needs for belonging and membership within the larger group and community. There are 27 sub-types - three variations for each of the nine personality types - depending on which of our three instincts is highlighted. Our sub-type describes our major concerns and focus of attention in daily life - the people and the projects that are most important to us. Sub-type activity is, in part, a way to discharge or resolve the passion or "lower emotional habit" of our personality type. Sub-type patterns and habits are one of the primary ways that we "fall asleep" in daily life. Each sub-type has a special intuitive ability and the potential to excel in a particular area of instinctual life. For some people, their primary sub-type seems very clear, while for others it's a matter of study and exploration over time. Those who know us well may also have some useful feedback, since we're not always able to see ourselves objectively. It can be a bit complicated because we each have all three instincts at work in our life. So you may identify with all three instinctual names for your Enneagram type. But which of these three areas is the most important overall? What you can do is consider the list of nine names for each of the subtypes. In other words, don’t just look at the names for your Enneagram point, rather look at each of the three lists in turn. One of these sets of nine terms will probably be more familiar to you than the other two. If you had to choose between them, which set of instinctual titles would best describe your concerns, habits and preoccupations over the long run - the nine self preservation terms, the nine social terms, or the nine one-to-one terms? (With the diagram of the three "instinct enneagrams," look at each of these and pick the one set that speaks to you the most). The set of nine terms you most identify with reflects your primary instinct, and therefore your particular sub-type. Of course our attention often shifts back and forth from one instinctual area to another. We may spend weeks or even months in one instinct domain and then shift to another, depending on our circumstances or interests. But in the big picture of our lives, one of these domains will be of more concern, or more compelling to us than the others. The 27 titles are somewhat inexact. They are meant to evoke or infer a certain theme. If you don't identify with the sub-type name on your point, look at the names for the points on either side of yours to see if those terms fit. This sub-type can be either very anxious or very self controlled. Concerns about survival and security are channeled into material achievements as a way to be a good person and do the right thing. It seems important to subdue nature and to impose order on the natural world. Family, home, food preparation, etc. take precedence over other needs. However, too much self sacrifice can fuel physical tension and resentment. This sub-type excels in creating warm, personable relationships with many kinds of people. Because of this great ability and the amount of attention spent in supporting and nurturing others, there can be a feeling of entitlement, or "me first," when it comes to getting one's own needs met. This may contribute to a prideful attitude. Or an insistence on going last supports another kind of specialness, as in false modesty. With this subtype, the Three's ability to work hard, perform well, and maintain the right image are placed in the service of material success. With their considerable drive and energy, this sub-type can accomplish their goals of financial security, a nice home, etc. The danger is losing contact with one's real self in this effort, and becoming overly identified with one's role at work. This is the willingness to jump into new situations, to pack up and move, to get going or take risks when the preservation instinct is highlighted, or when the authentic life seems elsewhere. To other people, it may seem reckless, like throwing caution to the winds, but it can work well with an unorthodox, creative or artistic style. There is a tension here between wanting to acquire material security and feeling detached from it all. Home is one's castle and a place to retreat from the world and feel safe. There is concern about having enough supplies which can lead to hoarding. On the other hand, this sub-type may be lacking in allegiance to any geographical location, forever traveling or moving from place to place, with a home in the backpack or the camper van. The style for this sub-type is to overcome fear by making connections and agreements with people through the use of personal warmth. They don't want to be left out in the cold. Experiencing a lack of warmth or a threat to their security early in life can create a fear of taking risks and a need to stay within well known boundaries. This sub-type likes to enjoy an abundant lifestyle within their family and circle of friends. There is an emphasis on sharing good ideas and conversation, preparing elaborate meals (or dining out), planning fun projects. There can be problems with over talking, over eating, and over stimulation. The aggressiveness and excess of the Eight are channeled into physical survival and material security. In a hostile world, they will win out (or go down fighting). Fiercely protective of friends and family, they can establish more territory and stockpile more supplies than anyone. But in a friendly world, they may miss the boat altogether. This sub-type excels at creating the practical infrastructure and the daily rhythms that support instinctual life. But there is a tendency to "fall asleep" or to narcotize oneself not only with food, but with all kinds of material consumption. (They often collect various items). A life of material abundance and comfort may preclude efforts toward personal or spiritual growth. This sub-type is comfortable with a secure social role and a clear set of rules. On their own turf they are usually quite friendly and gregarious. But their emphasis on doing things the right way can make it hard to adapt to new situations, and can also generate resentment or criticism towards others who may be acting "incorrectly." Self esteem is earned through both social approval and visible accomplishments. The Two's ability to empathize and attune to other people's needs is used to create an important, even indispensable role within the organization or the cause. Being allied with the right people is usually more important than taking center stage. The drive for success is directed toward winning social approval, knowing the right people, and achieving power in social institutions, whether in government, business, or community groups. There can be genuine social leadership or simply self aggrandizement through propaganda and image making. Feelings of deficiency can be provoked by social situations, with envy directed toward other people's status or membership. This sub-type seeks to establish an acceptable social role, possibly as the emotional truth teller for the group. There is a need to resolve the tension between the quest for individual authenticity and social expectations. This sub-type has a hunger for knowledge and mastery of the sacred symbols and language of the group or society (totems). Yet at the same time, an over-emphasis on analysis and interpretation can get in the way of participation and trap one in the role of observer or learned teacher. Being clear about one's role in the group or society is an overriding concern. Knowing the rules and creating clear agreements with friends and colleagues are vital for overcoming fear and avoiding rejection. Yet there may be ambivalence about belonging. Doing one's duty can be both a calling and a burden. There is a paradox here: social Sevens need their friends and their group projects to express both their social idealism and love of life, yet harnessing oneself to the greater good of the group or the community always involves some sacrifice. There are limitations to personal expansiveness and planning for future outcomes. This style is about overcoming powerlessness and injustice by being part of an aligned group, usually in a leadership role. Anger and aggression are both mediated by the needs of the group and harnessed to the common agenda. Loyalty to friends and the social cause takes precedence over personal feelings and needs. This sub-type blends well with the style and agenda of their friends and various social groups. The high side is leadership and selfless contribution for the common good; the problem is the tendency to "fall asleep" in a comfortable social role or through indiscriminate activities. A highly charged instinctual center is kept under strict self-control with clear rules and standards for correct behavior, leading at times to over zealousness in everything. Keeping the attention of the partner is vital to avoid self recrimination. Jealousy towards the partner is common, and may also be experienced toward other people who seem to have more room for self expression. All of the Two's capacity for interpersonal attunement and empathy is available to make the connection and win the approval of selected people in a one to one relationship, even a brief one. The use of body language and feeling tones can be experienced as seductive, although not necessarily in a sexual sense. Or the same capacity can be used in a more aggressive style that demands personal attention and recognition. The ability to create a successful image is focused on gender identity and issues. Personal power or charisma rests on being attractive as a woman or man. Yet underneath, there may be confusion about one's real sexuality. There is a tendency to stay in the performer role, whether on screen and stage or in personal relationships. Competition with other people is used to overcome a feeling of inner deficiency and create motivation for a personal agenda. Other people's power or strength is taken as a personal challenge, and usually creates a strong reaction. One's own value tends to rise and fall in comparison with other people. This is the sharing of confidences from the inner, private world in one to one relationships. Personal relationships are carefully selected. There can be a secretive quality, or a kind of profound reserve, reflecting some of the tension between the need to make contact and the need to preserve autonomy. The first style is based on overcoming or avoiding fear through willpower and feats of physical strength and bravery, or through the strength of one's intellect and fierce ideological positions. In the second style fear and self doubt are handled by channeling one's idealism and keen perceptiveness into creating beauty in one's environment. This helps create some stability and control. Suggestibility works both ways. One-to-one Sevens can be easily influenced by the attraction of new ideas, adventures, and people, falling into a state of fascination or "entrainment." They also have great powers of suggestion, and can use personal charm to lead people into a new paradigm, a new purchase, or a new relationship. One-to-one Eights use their forcefulness and self assertion to possess (or control) their partner or significant others. They may also be said to be possessed by this drive, unable to adapt or let go at times. The other side of this will show up as a yearning to be met so fully that one can surrender and let go of control, to be able to turn it over to the partner. One-to-one Nines have a longing to merge, either with a partner, nature, or God. This can be indiscriminate, or heedless at times, but it may also be a doorway into a transcendent state. In daily life it can show up as a problem with keeping personal boundaries and focus, since it's so easy to be pulled outside of oneself. How important is your home? How much time and money do you spend on your home? Can you easily move to a new living space? How important is your family? Do you experience warm relationships with family members? What is your current relationship to food - buying, preparing, eating? Do you like to share your meals with other people? How much time and energy to you spend on your physical health? Are you up to date in your health care appointments with doctors, dentists, etc? Do you feel financially secure? How much effort do you make towards earning money and managing money? Do you worry about this? What is enough? How important is it for you to have an intimate relationship? If you are married, how much attention do you bring to your partner? Do you prefer to spend time with your partner or close friends one on one, or would you rather spend time with people in a group? What role does sexuality play in your life? Do you have a spiritual practice, or a place in your life where you transcend your normal state of personality? Are you a member of any organized groups? What role or position do you usually play in groups? Do you experience a sense of belonging to a community? Do you have a sense of social duty or sacrifice for the greater good? Do you gravitate toward being of influence in social relationships and structured community? Are you engaged with social issues? Do you follow the news? Do you participate in government or political groups? Click here to purchase the Subtypes handbook as a PDF download.